On Saturday 12th Nov, the London and South East Craft Brewing Festival took place in Wimbledon. I was there bright and early (9am...) to help out as a steward. During judging, a steward is required to fetch entries for and assist the judges in their duties. As part of the educational aspect of this (yes, there is learning to be done here! 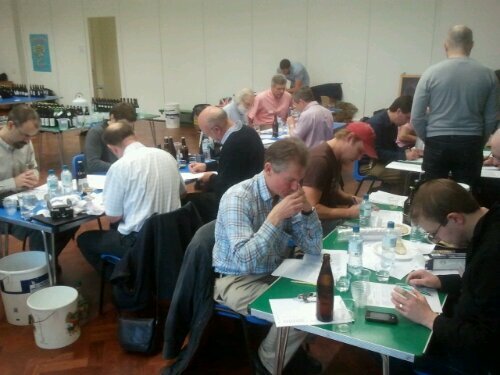 ), the judges very usually share the beer with the stewards to discuss the quality of the beer after completing their feedback forms. I was steward to John Hatch (from the Ram Brewery in Wandsworth) and to BJCP judge Ali Kocho-Williams (@alikocho), our flight consisting of Ordinary Bitters (8A) and Mild (11A) along with one Southern English Brown Ale (11B). Having been to similar competitions in previous years over in Sutton that were organised by Richard from Cheers, I found it interesting to see how the beers entered compared to those from previous years. Overall, the standard of beers entered was very good as usual, with much greater range of styles entered, and many more adventurous beers submitted. However, I found the standard in our flight to be somewhat lower than previous years in these categories – there were a variety of problems including: infections, beers having vegetal/”cooked” characteristics, under attenuated beer (“worty”), beer that was thin or lacking in finish, and unfortunately, one gusher. There were some stylistic issues such as milds that were too hoppy, and there were some beers that unfortunately were entered into the wrong category. While, as a steward, this it’s great for learning about flavour defects, it also backs up the idea that the hardest beers to brew are the lowest gravity styles – there is often little to hide behind and any defect sticks out like a sore thumb. 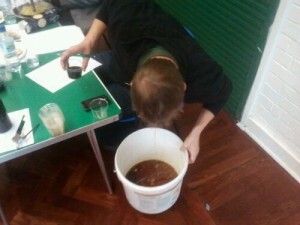 Defects aside, for ordinary bitters and milds, it is hard to get sufficient malt character into the brew – I think some of this comes down to yeast choice (e.g. I find WLP002 leaves a much stronger malt profile than, say, Nottingham). But, interestingly, Ali pointed out that the mashing process could well be the key here. On large scales (several BBL), the sparge will take hours, rather than 20min or so in a homebrew situation (1/8BBL!). Does the shorter sparge result in less malt character being carried over in the malt? Seems like a possible reason. Perhaps as he suggested, the no-sparge technique could be used to compensate here by using a larger proportion of the rich first runnings? Commercially, Fullers ESB (parti-gyled with London Pride) has a very rich malt profile – almost certainly with a strong influence from the mash/sparge process as well as their unique yeast. Additionally, related to the yeast choice is the pitching rate of the yeast you are using – it’s easier to under or over pitch in a homebrew setting. Perhaps the balance between getting good yeast derived flavours and not having enough healthy yeast to fully ferment the wort is an even finer one than maybe I previously suspected? On the subject of “entering the right category”, I saw several examples of this on Saturday. Now, before we get into a “the guidelines are wrong” type argument (again), these are the pre-set conditions for judging this competition – the judges have to use these guidelines to make their choices, so as an entrant, you need to do a bit of making sure that you’re giving your beer the best possible chance of doing well. So, from our set of beers, we had a strong mild (in the style of Sarah Hughes Ruby Mild) which actually did well in the flight – but it was discussed if it could have performed better in another class? The flavour profile and strength of Victorian/Edwardian style milds are a fair way outside of the mild guidelines (but of course, they are guidelines and not concrete limits...). Sarah Hughes itself (though slightly stronger than our example) is actually listed in Old Ale as an example of the style – would it have scored better there perhaps, or even entered as a lower hopped porter? And, as odd it is trying to place a real life distinction between classes 11B and 11C (Southern/Northern Brown), there will be an expected difference from a judge’s perspective. Manns and Newcastle Brown Ale are quoted as commercial examples in the guidelines – try them out to see the obvious difference. One is quite sweet and caramel with dark fruit, the other has much firmer bitterness. Some beers landed up being entered into Speciality (23A) on the basis of them being “too bitter” or “too hoppy” for the English bitter classes. There was one such speciality beer I tried in the tasting afterwards that was a very good APA, but I would happily have expected it to fall into the APA category rather than speciality, especially given the strong influence from the Columbus hops used. Possibly the best (or worse, depending on viewpoint...) example of “great beer, wrong category” (even by his own admission) was Fergus McIver’s (@fergusmciver) excellent “Taste the Darkness” that deservedly won the “People’s Choice” award. It was a great beer, heavily hopped with American varieties giving a strong resinous and citrus nose with a dark roast coffee/slightly plummy undertone. Citrus complimented the coffee/chocolate flavours very well, and bitterness was firm but not overwhelming. It was entered into Imperial Stouts (13F) which was a real shame – had it been entered into 13E (American Stouts), I think it could well have been in with a shout of winning! Another interesting moment during my judging flight came when dispensing a beer from our flight for judging – this was a mild presented in corny keg with party tap, and upon first serving into a jug, I got a lot of foaming which blew out any condition the beer had – and the beer itself seemed somewhat thin and lacking in aroma. After reducing the serving pressure by venting the keg off, the beer was markedly different – body increased and so did aroma, and the condition was much improved. Surprising how the tap used, or the pressure at which it is forced out makes such a difference to the same beer. There was a marked difference in the quality of the beer between the two versions of the same beer. So there we go – a very interesting, and tiring day. Congratulations to the winners (especially Tom Greasley for his winning Sweet Stout (“Sarcastro’s Stout”) and to the multi-talented roaming photographer Gregg Irwin (@dredpenguin) who not only picked up a 1st and a 2nd (Dry Stout and Belgian Speciality) but who also walked off with the award for best label design! Congrats! Check out Gregg’s post for a selection of photos of all the prizewinners. Thanks also to the guys from the London Amateur Brewers for organising the day – a lot of behind the scenes work takes place, and no event like this would take place without all their hard work! Nice write up Graeme and I can’t fault your logic having been privy to much of your stewarding experience and the wisdom of John and Ali. Was a really fun and educational morning and somewhat more drunken but no less fun afternoon. Interesting article Graeme. I entered this category and placed second, so must have done something right. Our beer was actually a parti gyle. I completely agree on the difficulty in getting the required malt ‘richness’ I use WPL002 but I can never get as much rich malt as fullers. I’d say to get anywhere close you have to go up a whole percent in alcohol in the home brew environment (maybe I will get there one day without). Trust me, as one of the judges this wasn’t a flight where subtleties really came into it. A significant number of the entries were simply unpleasant, and most were too thin. In the bitters, some weren’t bitter enough, in mild’s some were too hoppy. Balance is a fine line. As to getting the maltiness, I don’t know that you need to bump ABV, rather than I think you need to brew for a relatively low efficiency at the lower OGs to get more malt in. 70% seems to be a good number – don’t push it, don’t mash out. I even think maybe just putting all the water in at the start might work. Water chemistry and yeast choice needs to be a consideration. You aid you parti-gyled. What was the bigger beer? The bigger beer wasn’t in the comp. Half of it is Matt Leavers so you may see it at BCB one day. It’s an amber barley wine at 1110. I think it had come down to 1030 last time I checked. Strangely enough, I just tried using their fermentation profile myself (17->19->17->crash) on a beer I racked last night that used WLP002. It	s possibly the closest that I’ve got to their yeast derived flavours, but it’s still not quite there, so I suspect yeast pitching rates. Still pleasant beer, finishing at 1010 from 1042 (backing up my 75% attenuation again with this yeast). Do you have any idea of what your pitching rate was and what you plan to do in the next beer? Please keep me updated with your progress. In terms of cell count? No, but it was a single tube, 3 months old (stored in fridge), into a 1.4L stirplate starter. Crash cooled after 2 days and decanted the spent starter. EDIT: That was for 23L. I tend to simply follow the mrmalty.com pitch rate calculator. What about mashing at a higher temp (say 70) and going for a higher OG and lower attenuation? Or even crashing the beer before it has fully completed hits fermentation leaving it a few points higher then it would normally come down to?